Wonthaggi North Primary School students Tamika (left) and Levi (right) with their science teacher Marissa Cashmore. 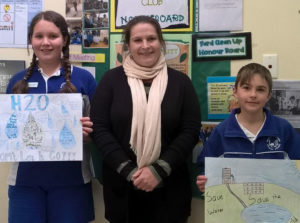 All students at the school have submitted entries to South Gippsland Water’s poster competition as part of their science focus on water and sustainability. Winners will be announced as part of National Water Week.